Is it a skirt? Is it shorts? 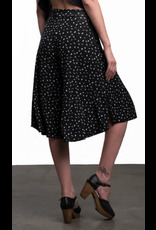 With it's fitted waistband and a-line shape, this piece moves like a skirt but actually has legs. X-Small: fits waist 26" - 28", hips 36" - 38", total rise 29", length ~ 26.5"
Small: fits waist 28" - 30", hips 38" - 40", total rise 30", length ~ 27"
Medium: fits waist 30" - 32", hips 40" - 42", total rise 31", length ~27.5"
Large: fits waist 33" - 36", hips 43" - 46" , total rise 32", length ~28"
X-Large: fits waist 37" - 39", hips 46" - 49", total rise 32.5", length ~28.5"